Opinions on kelp for livestock vary about as much as they do on politics and religion. While one person says it’s a savior, others say it’s dangerous. The truth is somewhere in the middle. And as always, keep in mind that conditions vary from farm to farm, so what works great for one farm may not work as well on another farm. Before we dive into the nutritional analysis of kelp, I need to tell you that it’s tough to find nutritional analyses of kelp. Most bags of kelp have no information on them in terms of what they contain. When I was at a conference in November, a representative from Thorvin Kelp said that’s because they have to meet a minimum level before they can claim to contain a specific nutrient, and most of them do not. When researching for this post, I searched for “livestock kelp” online, hoping to find at least a few for comparison. Although there is plenty of kelp available to buy, Thorvin was the only one I found that had a complete nutritional analysis. Although Source claims to have “at least 60 elements and their associated micronutrient compounds,” the only ones listed in their guaranteed analysis were protein, fat, fiber, and iodine. Since Thorvin was the only complete analysis I could find online, that’s what I’ll be using as a reference here, but keep in mind that levels in other brands of kelp may very well be much lower. Although kelp does contain dozens of nutrients, the only one that is in any decent amount is iodine. 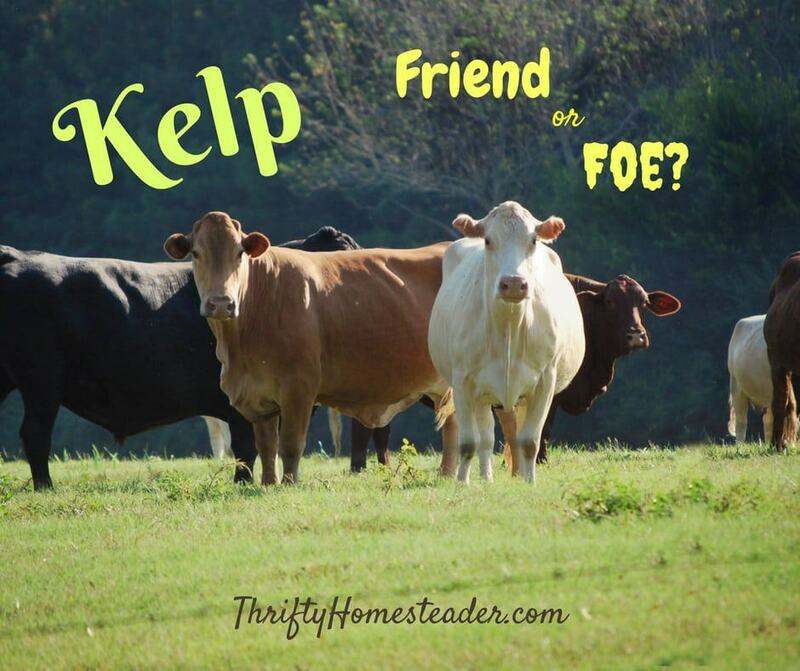 Kelp was used in a study to raise the iodine level in cows that were iodine deficient. Since the tolerable level of iodine is 100 times greater than the minimum level needed in ruminants, no one really worries about toxicity. However, if you have horses, they are very sensitive to iodine, so you should only give them the measured amount that is available in products specifically labeled for horses. Thorvin kelp has 780 ppm iodine, whereas Source kelp has 660 ppm, and Sweetlix Meat Maker for goats has 450 ppm. Sweetlix Stocker B1600 Mineral for cattle has 35 ppm. Some cattle minerals have no iodine listed at all, which may explain why cattle ranchers love kelp so much. Some people think that kelp is a good source of selenium, but it really isn’t. However, I think I found the source of that misinformation. That same study that showed kelp raised the level of iodine concluded that kelp was also a good source of selenium. Unfortunately, if you read the whole study (rather than just the abstract), you see that the group of cattle being fed kelp maintained their adequate selenium status while the control group’s selenium status went down. That’s a pretty flimsy reason to conclude that kelp is a good source of selenium. 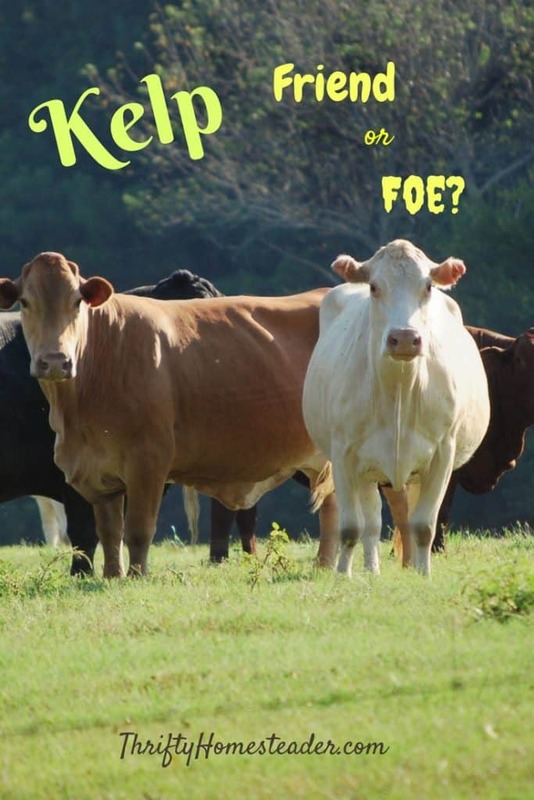 The kelp did NOT raise the selenium level of the cattle being fed selenium. Thorvin kelp has 0.5 ppm selenium. Compare that to Sweetlix Meat Maker, which has 50 ppm selenium and the Sweetlix cattle mineral with 24 ppm, and you can see that kelp will do nothing to increase the selenium level of an animal that is actually deficient. Yes, the goat mineral has 100 times more selenium in it than kelp. I’ve also been asked if kelp has so much iron it that it can bind with copper, causing copper deficiency in goats. I did not find anything in my research to understand where this came from, but the numbers do not support this assertion. Thorvin kelp has 622 ppm iron, whereas Sweetlix Meat Maker has 1.25%, which is 12,500 ppm, so the goat mineral has 20 times more iron in it than kelp, meaning there is no way the level of iron in kelp could be dangerously high. Some also worry that there is so much sulfur in kelp that it will bind with copper, causing copper deficiency, so let’s look at the numbers. The amount of sulfur in Thorvin kelp is 2.8%. So, if you know that goats need about 0.26% sulfur in their diet (according to Nutrient Requirements of Small Ruminants), that sounds like a lot, but how much kelp are they eating? If it was 1/10 of their diet, it would be perfect, but there is no way that it is anywhere close to 10% of their diet, as they only have a few bites a day. I think of how little kelp is in the mineral feeder compared to how much hay is in the hay feeder, and it’s not even 1% of their diet. While livestock will only consume a limited amount of sodium per day, I don’t think the sodium equation is quite as rigid as some nutritionists would have us believe. Many cattle producers have been providing kelp for decades with excellent results. I started providing free-choice Fertrell kelp for my goats more than ten years ago with great results. It doesn’t affect their consumption of other minerals because kelp is simply a salty food. It’s not just salt, and it has a distinct flavor. I personally eat seaweed snacks, including kelp, so I know how it tastes. Research has shown that goats and sheep are capable of consuming foods that contain specific nutrients in order to correct a deficiency, including this recent study, and they are able to do that based upon taste. If things taste different, they can associate that taste with the nutrient and consume it to correct deficiencies. I find the kelp debate fascinating. I think it may be the result of some enthusiastic kelp lovers over-stating its merits, which leads to skeptics worrying that it could be too much of a good thing. Have you heard any other “facts” about kelp? Any other nutrients or elements that kelp is particularly high in? Have you seen any studies about kelp? Share your thoughts in the comment section below. This post contains an affiliate link. If you buy something after clicking on the link, we will make a small commission while you pay the same price as you otherwise would. It is one way we are able to continue providing you with free content, such as this blog post, videos, and other informational material. This is fantastic! Thank you for your research on this subject. I do use kelp and I use Thorvin and I make sure that my goats get a dose of it everyday by making dosage balls because they don’t particularly like it. I give a tablespoon per 100 lbs and adjust up or down based on weight. I also include Fir Meadows Kop-Sel in the dosage balls every day based on weight. I offer free choice sweet lix mineral but they don’t seem to eat a substantial amount of it, and I have a redmond salt block out in their shed area which they use occasionally. I have Replamin on hand and if they start looking fish tail or rough coated or discolored hair I will dose them. I have two very light colored pygmy Nigerian wethers who are hard to gauge as far as discolored hair from copper deficiency but one is 10 years this month and the other is 6 years old. I also have a one year Alpine doe and an Oberhasli doe who is all red so I would think I would see orangy on the red doe and some reddish hair on the black parts of the Alpine. She only has black on the hind end. I rely more on hair condition and fish tail and that is why I use the Kop-Sel as an everyday plant base copper selenium supplement as I am in Florida sand land where the soils are deficient in almost everything. We feed perennial peanut hay mixed with coastal bermuda. More peanut for the girls more coastal for the wethers. I would love your advice if you think I am missing something here. And I thank you for putting out this newsletter. I have been on it for a good while and I learn a lot from you. !! Thanks for your comment. Have you put kelp in a mineral feeder all by itself so they can have it free choice whenever they want? You are the first person I’ve heard say that their goats don’t like kelp. Most people say their goats eat so much, they can’t afford to have it available all the time, so they only refill the kelp feeder every few days or once a week. The North Ronaldsay sheep are one example of animals that eat it naturally. They live on an island in Scotland and eat an absurd amount of kelp and other seaweed that washes up on the shore. There is no reason to have a salt block available for goats, and there is a very good reason to remove it — goats will only eat a certain amount of salt every day, so if they are eating plain salt, that will reduce their consumption of the Sweetlix mineral, which is 10% salt. They can get all the salt they need from the Sweetlix. Please don’t be fooled by Redmond’s marketing. Yes, all salt has lots of different types of trace minerals, but in such tiny quantities that it is not of value as a mineral supplement. Once you remove the salt block, you may find that you need to use the Replamin less often, and their consumption of the Sweetlix will go up. Wethers almost never have problems with mineral deficiencies because they’re not producing anything (no sperm, babies, or milk), and they have a very low stress life. Copper deficiency causes loss of pigmentation in hair, so all colors become lighter. Black becomes a rusty red. A cream doe will become snow white. When a red doe becomes copper deficient, their hair fades to a tan. There is a picture of copper-deficient red doe in my copper course and here: https://thriftyhomesteader.com/goats-and-copper-deficiency/ Her whole body should be the same bright red as what you see on her face and legs. I always say that you should never do something just because someone else does it. Their farm is different, other management aspects are different, and their goats are different. My friend four miles away never had to supplement with copper like I do because she doesn’t have well water with tons of sulfur and iron in it. If it ain’t broke, don’t fix it, and if it is broke, then figure out why and change that one aspect of your care. When I got started I was buying everything that everyone said worked so great for their goats, and I still had all kinds of problems. It wasn’t until I started reading the research and figured out exactly what my goats needed that their health and production improved. So, really the question is not how good your list of supplements look. The question is, do your goats look? You mentioned coat issues sometimes, which sound like copper. What about fertility and birthing? Thank you for the info! I see you provide kelp free choice. In your studies, have you found that is the best way to provide kelp to your goats? I give our lactating does Thorvin, but only top-dress their grain ration with it. I’ve found it rather difficult to find good info and recommendations in regard to feeding livestock kelp. Thanks again for all your work! Top dressing is fine. It seems that most people provide it free choice in a mineral feeder in the same manner as they provide baking soda or other minerals. All of those things should always be separate so the goats can take as much (or as little) as they want of each one. Kelp goes much faster than minerals or baking soda. In fact, when most people first provide it, the goats gobble it up within a day. Some people say that after a couple of weeks, the goats don’t eat it as fast, which I’ve found to be true. But they still go through it pretty fast. Since the toxicity level for iodine is so high, that’s really not a concern, but most people wind up only refilling the kelp feeder at whatever frequency they can afford. If you have more than a couple of goats, definitely buy it in 50# bags, as it is much cheaper than smaller quantities. Great article. I get 50lbs bags of kelp for goats and garden. It is Acadian Seaplants. Harvested from cold clear waters of N. Atlantic. The product comes from Canada. This is the best option available to us although we live in California. And logic tells me I should be getting pacific kelp from a carbon footprint stand point. But all that aside this kelp is certified organic. Would you comment on that?. How can kelp not be organic.? Are there kelp farms? Also have you heard anything about Pacific kelp vs Atlantic kelp. I think they are different species. Thank you for all the helpful info. I have not been able to find info about how kelp can be certified organic. From what I’ve seen, kelp is wild harvested. Everyone who sells N. Atlantic kelp talks about it being less contaminated than Pacific kelp because of the Japanese nuclear disaster a few years ago.